I've been thinking a lot about veganism lately - I met up with a friend for dinner the other day who went vegan for a while, and she told me it truly did take more thought, preparation and cooking time to make vegan meals compared to meals she made in her pre-vegan days. And, on top of that, making sure each item is organic is an extra thing to think about as well. She also has kids, so throw that into the mix and you can see how she'd get pretty pressed for time. That said, there's something awesome about having someone else cook for you, no matter where you fall on the spectrum (but it's especially awesome if you happen to be wanting to cook both organic and vegan - and eat it in the comfort of your own home). 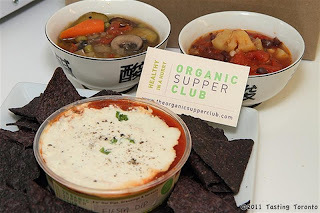 The folks at The Organic Supper Club, which has personal chef services and also does vegan/organic prepared foods and catering, was kind enough recently to send us a few vegan organic treats to try. We had their fiesta dip, summer vegetable ragout, and pineapple chipotle chili. I've got to be honest - I wasn't too thrilled with the pineapple chipotle chili, Mark actually liked it more than I did (I found it too tomato-y and the pineapple had lost its flavour) but I immensely enjoyed the fiesta dip and the summer vegetable ragout. The fiesta dip was impressive, using various nuts in place of sour cream, and it totally worked! It was delicious, with layers of black bean, tomato salsa and avocados. Yum! It'd actually be a pretty unique gift to give someone a week of vegan cuisine to try. And that's something they actually offer - I thought that was pretty clever. I think pricing is fairly reasonable for a gift, you can head to their website for more info. You can order online or you can also find their products at the Distillery's Sunday Market and the Organic Dufferin Grove Market on Thursdays. Mmmm this looks delicious! I would totally sign up for this if they had it in Calgary! I love that I made it into your blog! Woohooo!